Complex sites often require a combination of technologies for remediation. At heavily contaminated sites, in situ thermal treatment is used to treat the source, while other technologies are used in the transition and plume zones. The three major Thermal Remediation (ISTR) technologies are Thermal Remediation - Steam, Thermal Remediation - Electrical Resistance Heating, and Thermal Remediation - Desorption. These technologies can be combined with in situ chemical oxidation, in situ chemical reduction, bioremediation, permeable reactive barriers, and monitored natural attenuation to provide complete site solutions. They may be enhanced using hydraulic or pneumatic fracturing and emplacement of permeable materials. Thermal DNAPL Source Zone Treatment Impact on a CVOC Plume. Figure 1. Sketch of a complex site with multiple zones with different levels of contamination. A source zone where higher concentrations exist – typically in the form of non-aqueous phase liquids (NAPLs) or strongly sorbed contaminants. Note that source zones often have a component above the water table (in the vadose zone) and below the water table (in the aquifer). A transition zone where some NAPL may exist in small stringers, ganglia or droplets, but where the mass is smaller and concentrations lower. In some instances this is referred to as a dilute source or the plume core. A dissolved plume where contaminants of concern (COCs) exist in dissolved or adsorbed phases. Often, the plume is affected by lower permeability layers, where the COCs have diffused in and will provide a long-term source as the chemicals diffuse back out because concentration gradients are reversed during remediation. For successful remediation, it is crucial that every site is well understood and that a good site conceptual model (CSM) is developed. A good CSM is the basis for selecting remedial technologies that are effective in each of the zones. In source zones, technologies must often be effective both above and below the water table. There are several commonly applied technologies for the three different zones (Table 1). Table 1. Technologies applied in the different zones of a complex contaminated site. These technologies must be combined based on site-specific characteristics, remedial objectives, and the capabilities of each technology. One example of a combined remedy is when thermal treatment is used to reduce the source concentration/mass, and a set of permeable reactive barriers are used to control and remediate the plume in the years following thermal treatment (Fig. 2). Another example is thermal treatment of the source zone combined with bioremediation of the transition zone and dissolved plume (Fig. 3). Figure 2. Example combined remedy. Thermal treatment of the source zone combined with permeable reactive barriers for treating a long dissolved plume. Thermal source treatment is implemented in the first year, followed by plume treatment in a period afterwards. Figure 3. 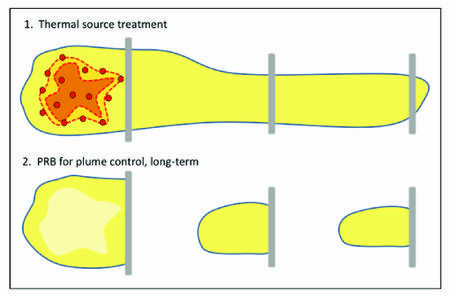 Example combined remedy: Thermal treatment of the source zone combined with bioremediation for treating the transition zone and dissolved plume. Red dots = heaters, green dots = bioremediation injection or extraction wells. Endicott, NY: A PCE source zone was removed using In Situ Thermal Desorption, reducing the source mass discharge by three orders of magnitude. Pump and treat and monitored natural attenuation was used for the plume. Five years after thermal treatment, the plume shrank and the pump and treat system was shut down. Memphis Depot, TN: Thermal treatment removed eight source zones from the upper 30 ft of a silty loess formation, while soil vapor extraction was used to remediate the less concentrated zones in between and below the source zones. Fort Lewis, WA: Thermal treatment of three source zones followed by enhanced bioremediation in the transition and plume zones (USACE; unpublished). Thermal technologies can be coupled with less intensive solutions to provide integrated solutions for complex sites. By treating the source zones thermally, most of the chemical mass is removed. This facilitates treating the transition zone and the plume effectively. Thermal treatment is most often combined with soil vapor extraction and enhanced bioremediation, but site-specific analyses must be used to determine the best options for each site.